Our Vision is to own the last-mile delivery of big-box items worldwide. As consumers demand faster delivery for their products, retailers and wholesellers must adapt and deliver products like never before. Our small but dedicated team at GoShare has been working diligently these past three years to develop modern transportation solutions for businesses which sell bulky items including furniture, mattresses, appliances, electronics, and more. We have successfully created a platform to seamlessly connect truck & van owners with retailers who need help with the cumbersome and ungrateful task of delivering goods from store to home, “The last mile.” We not only deliver these items but our team goes the extra mile to help assemble items when needed. By partnering with GoShare our customers are able to save more than 50% on delivery costs compared to traditional delivery services. Thanks to our proprietary technology and the power of a growing team of more than 1,200 delivery professionals we can offer our business partners the ability to compete with logistics powerhouses such as Amazon. Our three primary goals are to: improve the delivery experience for customers, create a primary source of income for truck and van owners, and increase shareholder value. GoShare’s mission is to empower people to help people by utilizing their trucks and vans. By promoting collaborative consumption on our platform we believe that we can help create a more equitable, sustainable and friendly world. 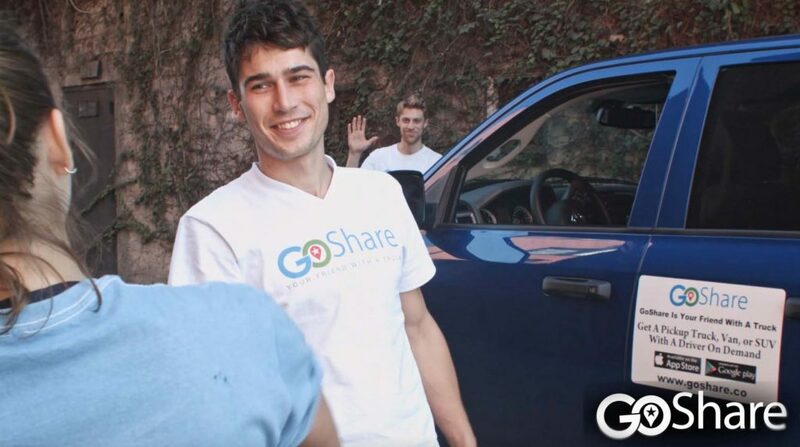 GoShare Delivery Professionalsare independent contractors who earn money using their own vehicles and lending a hand to people in their communities who need their help. All GoShare delivery professionals must pass a background check, vehicle inspection, and training before joining our platform. GoShare carries a cargo and liability insurance policy to protect the items that we are carrying for our customers. The company is based in San Diego, CA and operates throughout San Diego county, Los Angeles county, Orange County, Atlanta, Miami, and parts of New Jersey with plans to expand internationally. GoShare is lead by a group of experienced business executives including CEO Shaun Savage and backed by astute investors.